This is the full flavor that we have served from our antique popcorn wagons to our Milwaukee customers for year: white rice corn popped in coconut oil. Taste The Difference!!! When you order a chocolate malt don’t you want it to be thick and creamy, using real chocolate syrup? 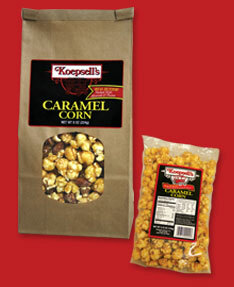 Well, we follow the same thinking with our cheese and caramel popcorn. Almost all cheese popcorn is made with an artificial cheese flavored powder. This method costs less, but we feel sacrifices quality and taste. 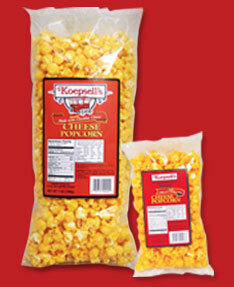 Koepsell’s uses only REAL CHEDDAR CHEESE, and the popcorn is double coated for a rich, more delicious taste. We use only the best Wisconsin cheese for this product. A Special Toffee blend adds to the distinctive flavor, sweet but not that sugary taste. Our customers cannot be wrong with the approval of this product. This is the SUPREME Caramel Corn, with a large volume of almonds and pecans, not just a few peanuts like some competitors, blended in with our "Red Wagon Caramel Corn", this combination makes for a truly gourmet sweet treat. Try it and you will be convinced. We dare you to try it! Packaged in a distinctive brown window bag. A smaller size is available in a clear film bag. 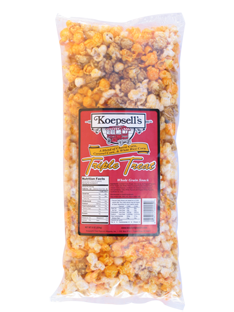 Triple Treat is a popular blend of our three best selling items, Cheese Corn, Carmel Corn and White Rice Corn. This combination creates a unique flavor experience for the popcorn lover that must be tasted to be truly appreciated. Traditional popcorn kernels are available in quart jars of either "White Rice" or Yellow. "A Product’s Best Trademark Is Its QUALITY" As you may know, most microwave popcorn is made of large, yellow hull popcorn. 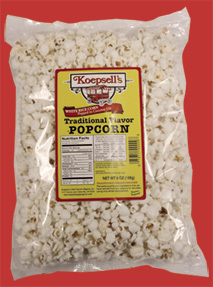 Koepsell’s "White Rice" popping corn is SWEETER and more TENDER with LESS HULL than the traditional yellow varieties. We use the highest quality "White Rice" popcorn and are proud to have our name associated with it. Consumers are looking for a healthy snack. 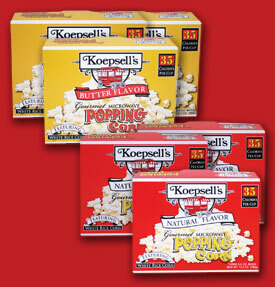 Our Natural and Butter Flavored Microwave Popcorn have only 35 Calories per cup, as well as reduced sodium. 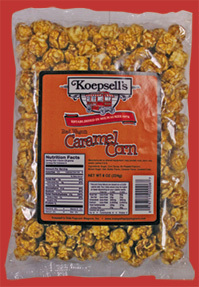 Please fill out the form below if you have any questions or comments regarding Koepsell's Popping Corn. Thank you! Flat $5.00 shipping and handling on purchases of ANY size. 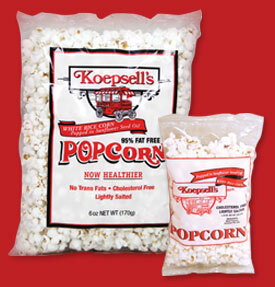 If you are in the retail business and would like more information on selling our products please contact Dennis Koepsell at koepsellspopcorn@gmail.com. Our products are widely sold at Woodman's, Sendik's, Pick n Save, Piggly Wiggly, and many independent stores.